Light Grey + The Sketchbook Project! Deadline coming soon! Our deadline for participating in the Sketchbook Project is approaching really quickly, so we want to share the information again and some of our own sketches for the project. This September, Light Grey Art Lab is pairing up with the Sketchbook Project for their 1703 Miles and Back Tour. This will be the first time the Sketchbook Project has ever been in Minneapolis, and we are thrilled to host and support the traveling sketchbook library! 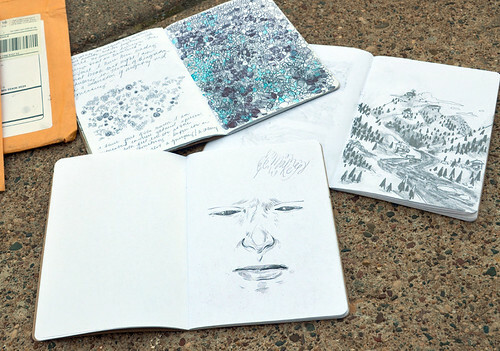 Just a sneak peek of some of our sketchbooks! We still have a ways to go, but we're gearing up to submit! The library will arrive in town Sunday, September 22nd, and will only be in town for one day! We will have a huge get together where everyone is invited to check out sketchbooks, view other artists work, and see the current exhibition, which will include pieces from all of the sketchbooks! Extended Deadline- Please sign up by June 10th! 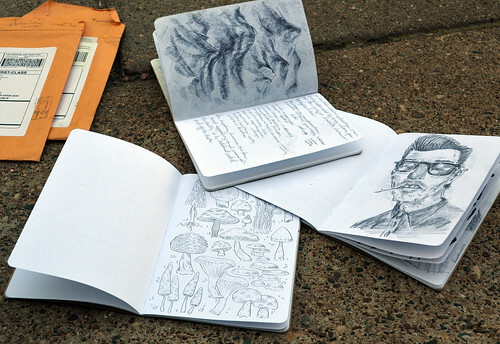 Another look at Jenny, Lindsay and Chris's sketchbooks! Can you guess which one is which? Thanks, everyone, we cannot wait to see all your sketchbooks!